Famous people born on NOVEMBER 26 really prefer to be coupled with someone who they have a lot in common with. As a Sagittarius, they feel complete with a partner. They could have marriage on their mind as they want children. Making a commitment to love is what they have come to find essential to their happiness and having someone to teach and watch grow with is important to them. Normally, they are full of confidence and have an optimistic outlook on life. They can see good in everybody. 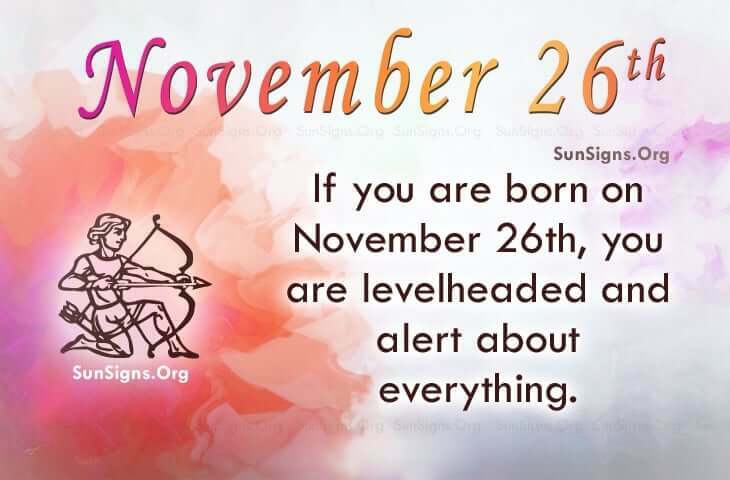 Famous people born on November 26 get joy in meeting people as they are a people’s person. More so, they like learning about other people’s culture and customs. They want things done in a certain way so usually this means they do it themselves. They could be more open minded when it comes to communicating with others however and their ideas. They like their life to be arranged or planned and stable. Famous celebrities born on NOVEMBER 26 are levelheaded and alert. They get what they set out to accomplish. Typically, theirs is the only opinion that matters or so they say. These Sagittarius personalities are highly active but need someone with stability.